Fibertex SA – Secugrid Geosynthetic Geogrid Reinforcement for Retaining Walls. Fibertex South Africa – local distributors for the German-manufactured Naue Geosynthetics range of Geogrids – supplies durable PET (polyester) and PP (polypropylene) high-strength reinforcement Geogrids for all civil engineering applications, including mining, environmental, infrastructure and marine engineering projects. “Fibertex South Africa has partnered with Brent Corporation, assisting with the technical support, supply, installation and quality checks for the retaining walls being installed at the new Reddam College located in Ballito, North of Durban, KwaZulu-Natal,” says Meera Govender, Technical Sales Engineer, Fibertex South Africa. 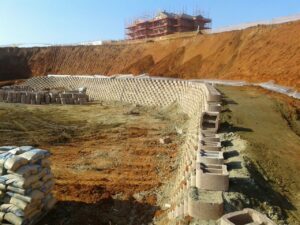 “Construction of these retaining walls required extensive earthworks, in order to execute the exact design heights and levels required. All retaining walls were constructed with compacted soil layers reinforced with Secugrid® 80/20 R6 polyester geogrid. Embedment lengths varied from 4.0 to 6.0 m. The largest wall (140 m x 5.5 m average height) composed of 10 individual layers of geogrid. A total of 6 000 m2 of geogrid (including approximately 725 m length of the 2 m wide Flexidrain composite drainage system) reinforced approximately 9 000 m³ of backfill material. The project is due for completion at the end of 2018. Secugrid is designed to strengthen naturally unstable soil and subgrades, so that the composite soil structure is able to withstand the required loading conditions, through both an interlocking and frictional effect, with little or no movement in the overlying soil materials over the structure’s lifetime. This robust reinforcement material is also highly resistant to biological and chemical degradation, as well as installation damage. Secugrid is supplied in rolls and is quick and efficient to install, with minimal demand on labour resources. Panels are joined and continuity is assured with simple overlaps. Standard cutting tools are used for on-site trimming and various geometrical shapes for steep sided slopes can be formed. Secugrid is manufactured from extruded monolithic PET or PP strands that are drawn to orientate the polymers into high-tenacity flat bars to achieve a high modulus i.e. high strength at low elongations. This feature, combined with the Naue patented welding technology, provides a structurally sound and stable geogrid. Furthermore, the surface of the bars are embossed, inducing additional frictional interaction with the soil. This enables the Secugrid to pick up the load transfer quickly, through both an interlocking and frictional effect, with little or no movement in the overlying soil materials. Flexidrain is an extruded high density Polyethylene (HDPE) Geonet, covered with a Fibertex F-25 Polypropylene (PP) staple fibre non-woven geotextile jacket, to form a wick-drain Geosynthetic composite. The subsoil water will be led to a front collector drain behind the toe of the retaining wall and discharged into Fibertex Drainex DN110 drainage pipes, which are also chemically inert. Other Naue Geosynthetics products available locally from Fibertex include Bentofix Geosynthetic Clay Liners (GCLs), which are composite materials, designed for use as efficient sealing barriers in various applications, including landfill projects. Fibertex supplies an extensive range of environmentally-friendly geosynthetic products from its KwaZulu-Natal, Gauteng and Western Cape facilities, that encompasses nonwoven and woven geotextiles, gabions and mattresses, drainage pipes and fittings and erosion control and cellular confinement solutions.